Here are a few open-to-the-public magic shows coming up in December. All programs are free unless noted otherwise. I recommend my shows for ages 5+. See great photos from my holiday magic shows. Send e-mail to jeff[at]amazementproductions.com if you are interested in attending a show and want more details. I also try and post upcoming shows a few days in advance via twitter and facebook, so feel free to connect with me there also. 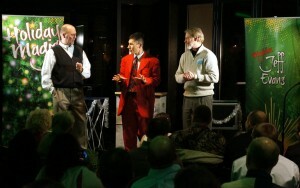 This entry was posted in Uncategorized and tagged Christmas magic shows, holiday magic shows, Jeff Evans, seattle magician. Bookmark the permalink.